All libraries have a set of basic parameters which library administrators can configure. 3. In the Title field, you can rename your library. 4. Add a custom URL to your library. Learn more: Configure the home URL. 5. Create a redirection URL. Learn more: Define a URL for redirection. 6. Add a notification address to which library notifications will be sent. Learn more: Define a notification address. 7. Configure the number of days documents are kept in the library's trash after they are deleted. The value by default is 30 days. Learn more: Manage deleted documents. 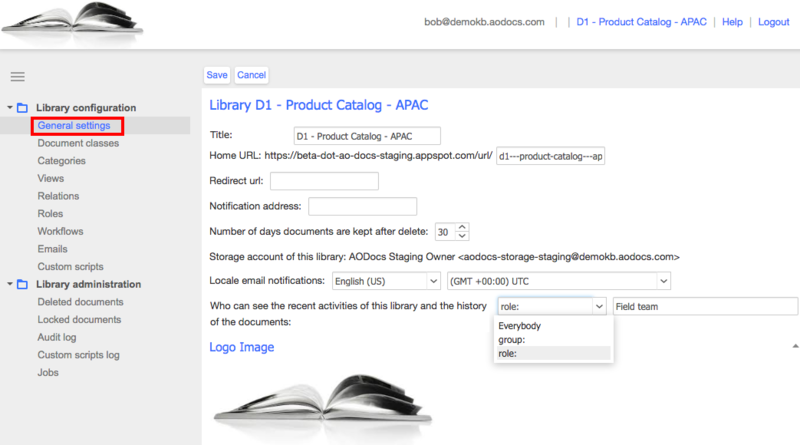 Important: AODocs is synchronized daily to remove documents that have exceeded the retention time. For example, if a document should be kept in the library trash for one day, it will be removed from the deleted documents (library trash) between one and two days after the deletion. 8. View the name and email address of the storage account of your library. Learn more: Configure how properties and the time are displayed in workflow emails. Important: Don't select a role that's based on a Person field, as these roles don't have a specified list of members. Learn more: Configure roles.